Acquiring trademark protection is critically important for any brand or business. Trademark laws protect names, logos, designs, and other marketing devices that identify a product or service of a particular source from those of others. Not every trademark can be federally registered with the USPTO. Trademarks cannot be descriptive or confusingly similar to a previously registered trademark, but must be distinctive or have acquired secondary meaning to be registered with the USPTO. Once registered, to continue to receive trademark protection, trademark rights must be maintained through actual use of the trademark. The trademark will be abandoned if the trademark’s use is discontinued after a certain period of time (typically 5 years). Trademark protection also requires monitoring and renewal. Failure to renew the trademark at the designated times can also result in abandonment of the trademark. A federally registered trademark provides many trademark benefits to the owner of the trademark by providing the exclusive right to use the trademark. Trademark protection also provides the owner the ability to seek court enforcement of infringing trademarks. Trademark registration give you a presumption of validity. It also creates nationwide protection as well as the ability to register your trademark internationally, which is the biggest advantage of filing your trademark with the USPTO. Common Law protection gives trademark rights based on priority of use in a certain geographic area. However, a registered trademark user is given exclusive rights to use the trademark nationwide. 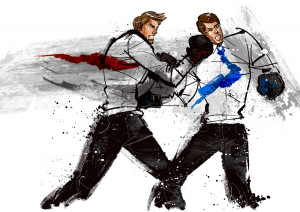 The only way for a trademark user to defeat a registered trademark user is if they can show they used the trademark prior to the registration’s filing date and if they had acquired common law rights. This only protects the trademark for that geographic area – not nationwide. Thus, the best way to obtain the highest legal protection is to use the trademark and file for federal trademark protection. Federally registering your trademark provides the added benefit of being able to enforce your trademark rights in a lawsuit in U.S. federal courts. There are various advatanges to suing in federal court, one being the ability to recover attorneys’ fees as well as the ability to recover the maximum amount of damages, treble damages, in a trademark suit. This deters others from infringing on your trademark.